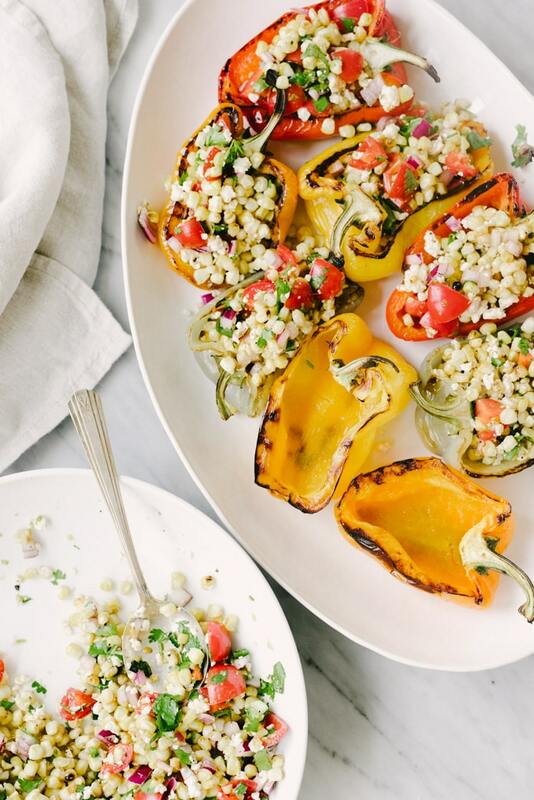 These grilled mexican street corn stuffed peppers are a fast, easy, no-oven-required recipe. They are packed with veggies (and flavor!) and make for a delicious light lunch, or easy side dish. Stretch this dish even further by adding a few cups of cooked black beans to the filling. I’m back! Finally. It’s been a long month. Dozens of stubbed toes, boxes, midnight expletives, and take-out meals later, we are totally moved into our new house. Wheee! 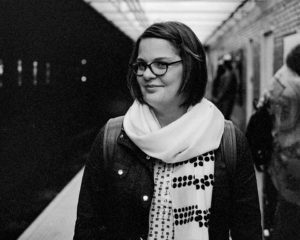 We’re taking some time to get acquainted with our new city and community and so far, we’re totally in love. I’ve joined the local coop, and checked out the closest farmer’s market. Cam and Cass have been exploring hiking trails, and I took the kids to a fabulous petting farm that’s basically around the corner. Frederick has a lot to offer when it comes to farm-fresh and locally sourced foods. So far I’ve barely scratched the surface and I’m excited to see what food adventures await in the coming weeks and months. But enough about the move. 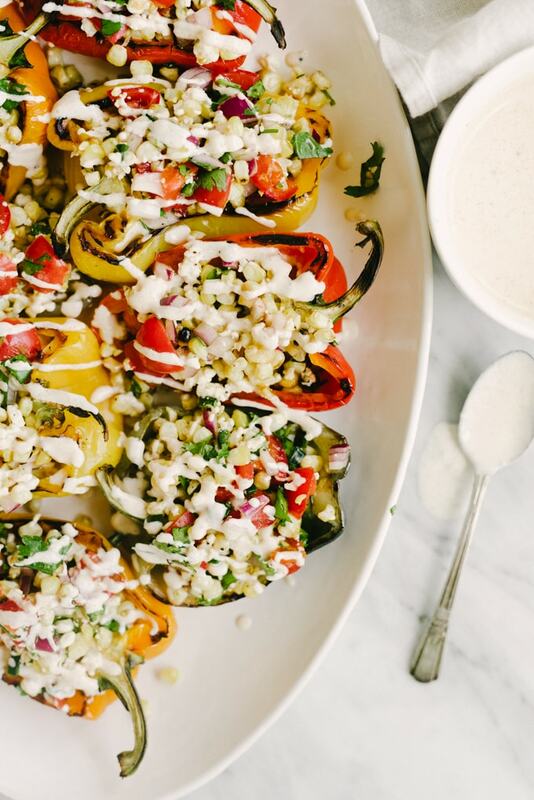 Let’s talk about these grilled mexican street corn stuffed peppers! The first thing I bought for our new house was a Weber Kettle Grill. Okay, maybe not the first thing, but it was definitely within the first week, so close enough. I’ve been eyeing a Big Green Egg for quite awhile, but it’s an investment. And to be honest, I wasn’t 100% comfortable with charcoal grilling. It’s been a long time since I’ve used a charcoal grill with any regular frequency, and I wasn’t sure that I would like the experience as much as gas. Well, here we are two weeks and half a dozen meals later and I love my charcoal grill. I’m addicted. I want to learn to make everything on a charcoal grill, and my charcoal grill accessories wish list on amazon is growing by the day. Expect to see more grilled deliciousness in the future. Corn is e.v.e.r.y.w.h.e.r.e right now, and it’s crazy fresh and delicious, especially after some time on the grill. I am a huge fan of corn cooked every which way (see more fresh corn recipes here! ), but grilled is by far my favorite. Traditional mexican street corn is grilled over charcoal until it’s charred and tender, then slathered with a limey, spicy mayo/sour cream/cojita cheese mixture. It’s crazy good. Literally finger licking delicious. 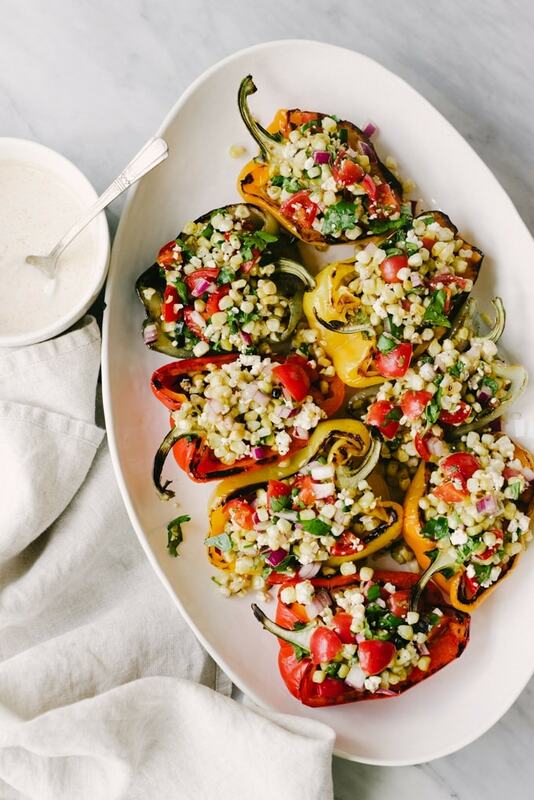 This version with stuffed peppers is similar, but in salad form because vegetables are awesome. And also because I wanted more stuff to grill. This is a fast and easy weeknight meal that’s cooked entirely on the grill – no-oven-required recipes are always good news in August. On my charcoal Weber, which I heated to about 500*, the corn took about 17 minutes, and the peppers about 9 minutes. While the corn and peppers are cooling down, you’ll prep the remaining ingredients and mix the dressing. If you’re using a gas grill, turn the flame on high and keep the lid closed to ensure fast, but even, grilling. You want to cook the corn until it’s tender, but slightly charred, for best flavor. Cook the peppers until the flesh is charred and cuts easily, but still retains its shape for easy stuffing. I added tomatoes and red onion, and a jalapeño for a kick. You could use scallions instead of red onion, and perhaps some cucumber for extra crunch. You can make this vegan by omitting the cojita and substituting vegan mayo for the greek yogurt. 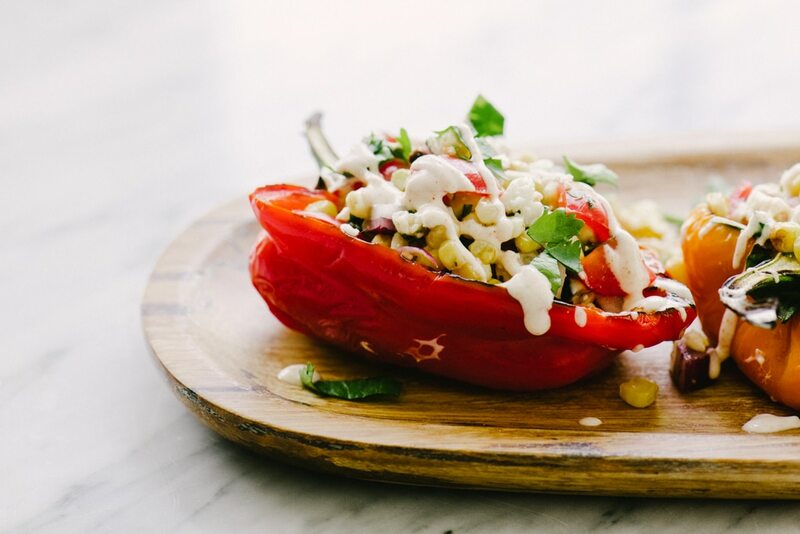 Grilled mexican street corn stuffed peppers are an excellent side dish to carnitas or quesadillas. Make it a meal by adding two cups of black beans to the filling. Cameron and I had this as-is for a light lunch (two halves each) and it kept our bellies full and happy until dinner. 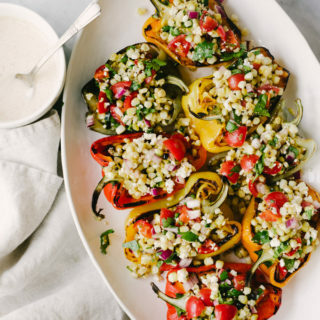 These grilled mexican street corn stuffed peppers are a fast, easy, no-oven-required weeknight meal. They are packed with veggies (and flavor!) and make for a filling lunch, or easy side dish. Stretch this dish even further by adding a few cups of cooked black beans to the filling. Preheat a grill to high heat. Brush the corn kernels and the interior and exterior of the bell peppers with the avocado or olive oil (I use a silicone basting brush). 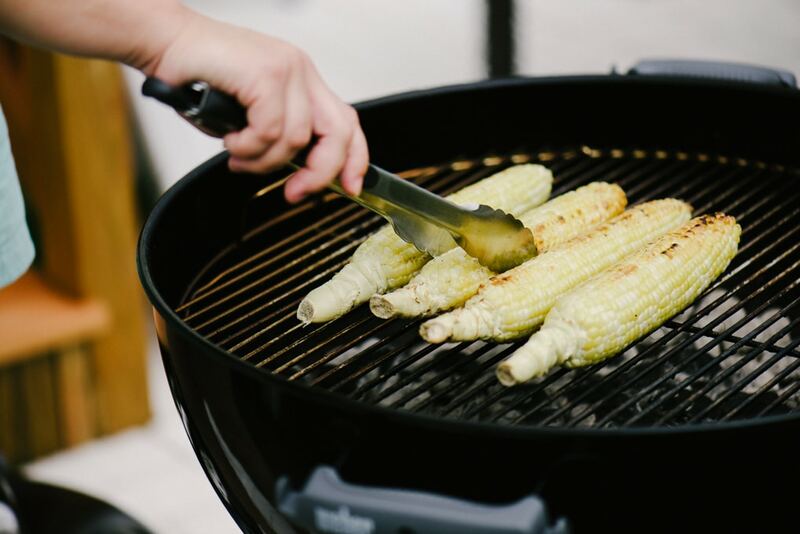 Place the corn on the grill and cook, rotating a quarter turn every 3-4 minutes, until the kernels are soft and lightly charred, 15-20 minutes. 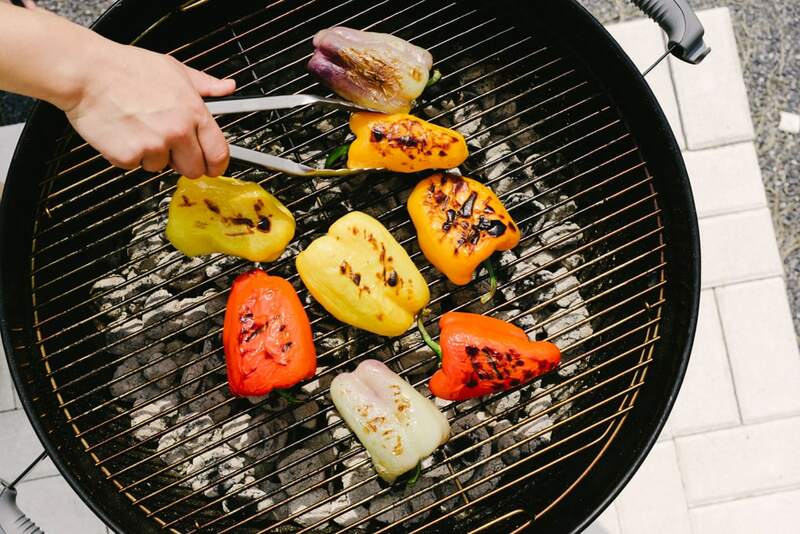 Place the bell peppers on the grill, exterior side down, and grill, turning once, until the exterior is charred and the flesh is soft, but still firm enough to hold its shape, 8-10 minutes. Remove the corn and bell peppers from heat, and set aside until cool enough to handle. 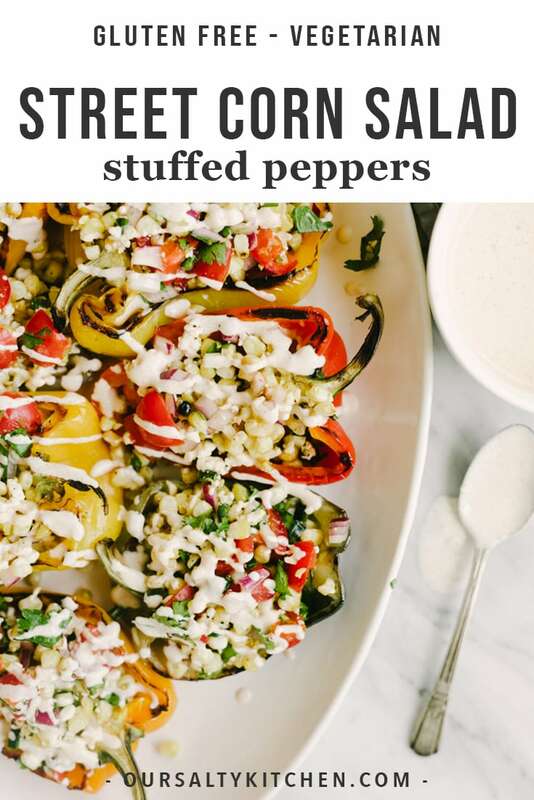 While the corn and peppers are cooling, prepare the remaining salad ingredients - dice the onion, cilantro and jalapeno, crumble the cheese, and zest and juice the lime. Prepare the dressing. In a small bowl, mix the yogurt, lime juice, cumin, and a pinch of salt and cracked black pepper. Once the corn is cool enough to handle, slice the kernels from the cobs. 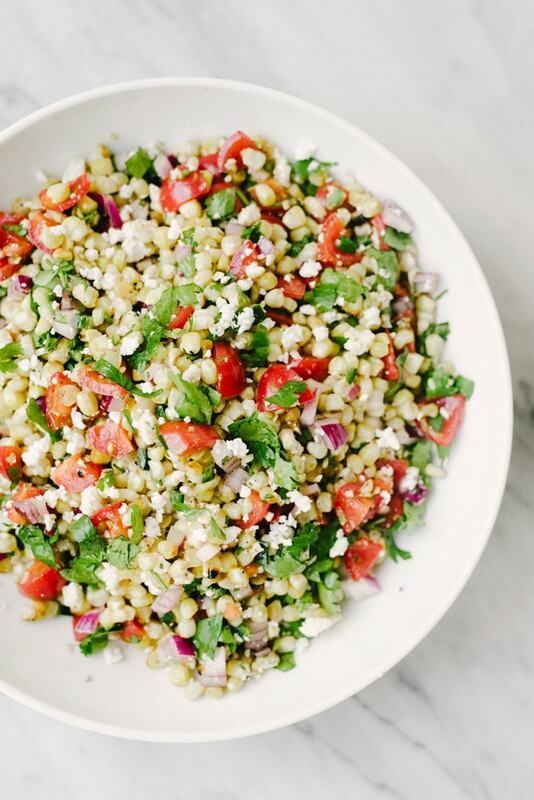 In a large bowl, mix the corn kernels, tomatoes, red onion, cheese, cilantro, jalapeno, lime zest, and salt and pepper. Stuff each pepper with the corn salad, and dress to taste. Serve immediately. Make it Vegan: Omit cojita cheese; substitute vegan mayo for yogurt. Add black beans for a more substantial filling or extra protein. Disclaimer: This post contains an affiliate link, which means we receive a small commission if you make a purchase using this link. Previous Post: « Checking In! Oh my gosh this is spectacular! I made extra corn salad and had that for lunch the next day. Thanks for the recipe, I will be making it a lot!